"Using a thumb button control for precise pouring, the can prevents random spills and leaks with a durable container." "No-spill 7/8-inch spout with a dedicated release control button...this one is designed to keep leaks and spills down to a minimum." "Large enough to carry two gallons of gas...you can easily install onto an ATV, snowmobile, or other offroading vehicles." "Large wheels and a ten-foot hose allow you to roll the gas can up on the dock and fuel up without...multiple trips to the pump." "Using a single piece design, the can prevents leaks and harmful spills that can be dangerous around active generators." "Using a large ID, bright red finish, and solid build construction, this gas can keeps hazardous liquids inside until you are ready to use them." "Secures to virtually any offroading vehicle with Kolpin’s utility gear rail system or similar mounting hardware. This keeps the pack secured." Gas cans may seem simple in principle, but the right design can mean the difference between safe transportation of harmful gasoline and dealing with a spill. The best gas cans do more than just carrying the dangerous liquid around on the go. They keep the gasoline contained and sealed until you are ready for it. That is why this top pick gets the job done with a few unique features you won’t find on most other options. The No-Spill 1450 5-Gallon Poly Gas Can is the perfect containment vessel for dangerous liquids like gasoline. Using a thumb button control for precise pouring, the can prevents random spills and leaks with a durable container. The 7/8-inch spout fits into many pouring spaces as well. Coming in at five gallons, this can is a good option for use with heavy machinery or around the home. Budget gas cans are common since most options are more affordable than a tank of gasoline in a typical car. With that said, it is important to find a budget gas can that gives you more reliability and usability than standard options. 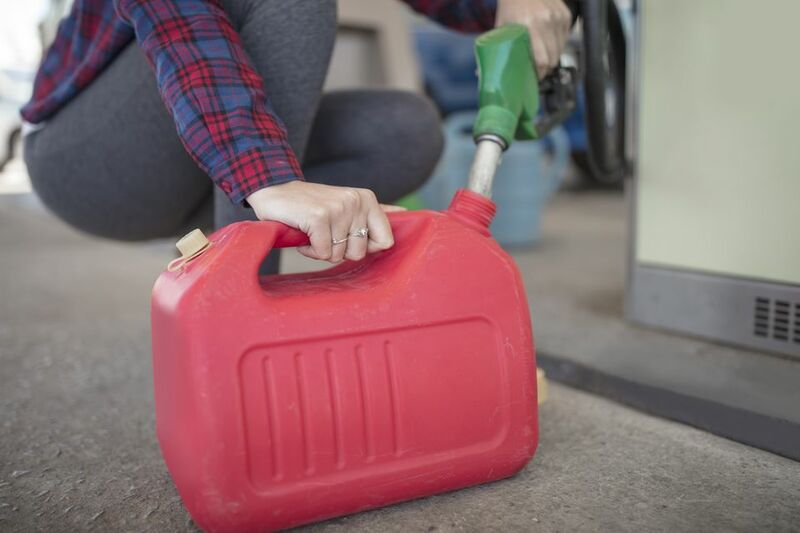 Since transporting gasoline is dangerous no matter how expensive the can is, you need to know your chosen gas can will keep you safe as you use it. For small fill ups or small equipment, the No-Spill 105 Poly Gas Can is a 2.5-gallon gas can that features a no-spill 7/8-inch spout with a dedicated release control button. Like all of the gas cans under the No-Spill banner, this one is designed to keep leaks and spills down to a minimum. The spout is small and compatible with many types of engines/motorized equipment. Where can you go to fill up your boat when the time comes for more fuel? While some lakes and rivers have fuel stations, the best way is to bring the fuel right to the side of the dock. To do this, you will need a special gas can that carries more fuel in a safe manner. Some wheels to make hauling the extra fuel around easier will not hurt either. Combining high fuel capacity and easy maneuverability, the Scepter Duramax is more like a mobile gas station than a simple gas can. The 14-gallon capacity will give you plenty of fuel for a good time out on the water. Large wheels and a ten-foot hose allow you to roll the gas can up on the dock and fuel up without the hassle of using smaller gas cans during multiple trips to the pump. Whether you have some extra fuel lying around or want to stock up for the upcoming zombie apocalypse, long-term storage of gasoline and other dangerous fuels can present a unique problem. Over time, normal gas cans can start to break down or develop small cracks that allow the fuel to escape. Therefore, any gas can you use for long-term storage needs to be durable. The Justrite Safety Can is designed to eliminate any ambiguity about what it contains inside its metal body. Using a large ID, bright red finish, and solid build construction, this gas can keeps hazardous liquids inside until you are ready to use them. Compatible with many liquids like gasoline, kerosene, and diesel, the seal can prevent liquid and gas leaks. The long spout also makes it easy to fill up equipment when the time comes. Going offroad is a tricky environment for most gas cans. On one hand, you need an extra gallon or two of fuel in case of an emergency or to extend your range. At the same time, the rough terrain and ride you are likely to encounter can damage most traditional gas cans, causing leaks, harming the environment, and putting you in danger. Offroad-specific cans, however, can take the abuse without issue. The Kolpin Fuel Pack is all about safety and durability. With a four-gallon capacity, the gas can will not leave you stranded out in the wild when your vehicle of choice starts to run out of fuel. Using a dual mounting point design, the fuel pack secures to virtually any offroading vehicle with Kolpin’s utility gear rail system or similar mounting hardware. This keeps the pack secured to the vehicle, even during rough bumps and jumps.